This year, nearly 16,000 children in the U.S. will be diagnosed with cancer. And many more will struggle with the debilitating effects of sickle cell disease, the most common inherited blood disorder. Our goal at the Aflac Cancer and Blood Disorders Center of Children’s Healthcare of Atlanta is to eliminate these diseases once and for all. But we can’t do it alone. September is Childhood Cancer Awareness Month and Sickle Cell Awareness Month. This month, we want the battle cries in the fight against pediatric cancers and blood disorders to ring throughout our community. 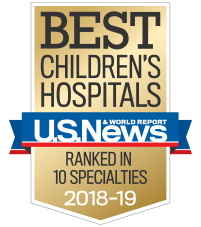 “Blood counts,” “transplants,” “transfusions”—for our doctors and nurses, these words are significant in their fight against pediatric cancers and blood disorders. But for the patients who depend on us for their care, the words that matter are the ones that lift their spirits and help them get through another day. 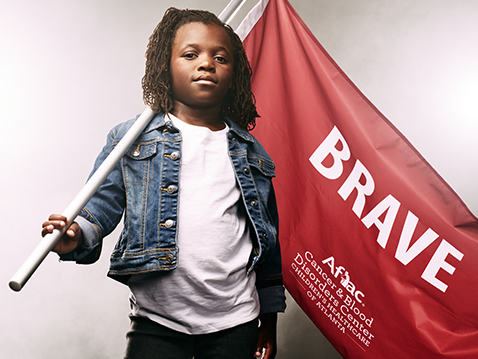 Words like “brave,” “fearless” and “strong”—these are the words they choose to define themselves as they fight to overcome these complex diseases. These are the words that matter most. Dine out or shop ‘til you drop at these community partner locations to help us do more to combat childhood cancer and sickle cell disease. Proceeds from these promotions benefit the Aflac Cancer and Blood Disorders Center. Kendra Scott: Shop at an Atlanta-area Kendra Scott location on Saturday, Sept. 8 from noon to 3 p.m., and 20 percent of all proceeds will go toward helping the Aflac Cancer and Blood Disorders Center find a cure. Chipotle: On Wednesday, Sept. 19, visit any Chipotle in Georgia, say you’re there for the fundraiser and 50 percent of all proceeds will benefit the Aflac Cancer and Blood Disorders Center. Johnny's NY Style Pizza: Visit any Johnny’s NY Style Pizza in Georgia in September, donate $5 to the Aflac Cancer and Blood Disorders Center and Johnny’s will treat you to a $5-off coupon for a future visit. Nothing Bundt Cakes: Visit any Nothing Bundt Cakes in Georgia and donate $3 or more to receive a Free Bundtlet coupon for your next visit. Chick-fil-A: Purchase six cookies from any metro Atlanta Chick-fil-A during the month of October and all proceeds will benefit the Aflac Cancer and Blood Disorders Center. With numerous events each year benefiting the Aflac Cancer and Blood Disorders Center, there are many easy and rewarding ways to lend your support. Arnie's March: Arnie's March Atlanta will be a fun, family-friendly fundraising walk held at the TOUR Championship on Saturday, Sept. 15 from 9 a.m. to 11 a.m. Swim Across America: Come out and cheer on hundreds of swimmers (including Olympians) at Swim Across America on Saturday, Sept. 22 from 7 a.m. to noon. All events: Check out even more ways to support the Aflac Cancer and Blood Disorders Center in your community. Become a Facebook Fundraiser: Are you on Facebook? Great news—you don’t have to leave the site to make a difference. Now you can help the Aflac Cancer and Blood Disorders Center by using Facebook’s fundraiser tool. Consider asking your friends to donate in honor someone you know, celebrate your birthday or just because. Any amount makes a difference. 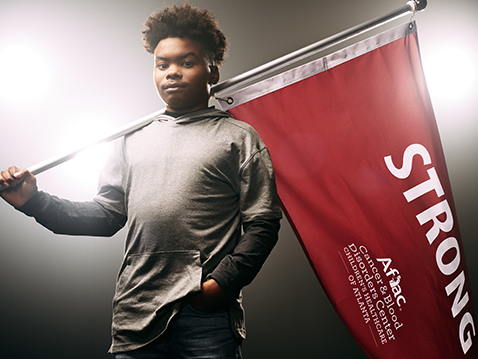 Purchase a flag: Make a donation of $1,000 or more to the Aflac Cancer and Blood Disorders Center and you will receive a commemorative flag. We’ll fly these special flags over our hospitals each day in September. When the month is over, we’ll mail you a flag, along with a certificate of authenticity, as a thank you for your generous support. You can also make a $20 donation and receive a small garden flag. Shop our e-store: Shop for t-shirts, hats, water bottles and more. All proceeds benefit the Aflac Cancer and Blood Disorders Center.